Open from 10.00 to 17.45 from Sunday to Wednesday and Fridays. Open from 10.00 to 19.45 on Saturdays. The museum is open throughout the year so you can visit at any time. The busiest hours are usually between 11.00 and 15.00 so try to avoid visiting at these times. The Art in the Round public tour begins daily at 14.00. We are comparing Guggenheim Museum New York Skip the Line Ticket Prices from leading ticket suppliers and Try to find you Cheap tickets prices on the market. The Solomon R. Guggenheim Museum was opened to the public in 1959 inside of Frank Lloyd Wright’s iconic building. A favourite feature in New York for its innovative design built with an elegantly spiralling platform which rises to a glass dome. This is a time-saving ticket is aimed at people who want to see the very best that contemporary art has to offer and to see it displayed inside one of the most contemporary buildings in New York City. Your Experience With Guggenheim Museum New York Skip the Line Ticket? Benefit from skip the line entry to one of the most interesting art galleries in the Big Apple. Once you’ve taken in the unique architectural design of the Guggenheim Museum continue to the exhibitions to see the masterpieces of contemporary 20th-century artists including Kandinsky Monet, Picasso, and Cezanne. Compare exhibitions of Impressionist styles with exhibitions of the Post-Impressionist era. Learn about the hands and brushes of the artists who gave life to these captivating pieces and discover the influence they had on the developing art world. What Guggenheim Museum New York Skip the Line Ticket Includes? Fast-track entrance to the Guggenheim Museum. Convenient same day re-entry pass. A complimentary multilingual audio guide offered in English, Spanish, Italian, German, and French. Optional free ‘Art in the Round’ public tour of the Guggenheim Museum. We recommend giving yourself around one to two hours to visit the Solomon R. Guggenheim Museum, this should be enough time to visit the exhibition however you will be welcome to stay until closing time if you choose to. Travelers Reviews about Guggenheim Museum New York Skip the Line Ticket? Comments from TripAdvisor users who have visited the Guggenheim Museum have commented on the beautiful and innovative architecture and mention that it hosts interesting exhibitions of conceptual art. Visitors have pointed out that if you visit while exhibitions are being changed you receive discounted entry, however, it is not possible to view the majority of the artworks so it’s best to check online for their scheduled exhibition changes. On Get Your Guide the museum has earnt a very positive 4.6 out of 5-star rating. Travellers generally talk about smooth and quick entrance that the skip the line tickets provide. The museum is wheelchair accessible on all levels with the exception of the High Gallery (there are stairs to reach this section of the museum). You can present either an electronic voucher or a printed voucher at the museum’s entrance. Your voucher will be sent to you via email on the same day that the reservation is made. The listed ticket providers will allow full refunds for any cancellations made up to 24 hours in advance. If you decide to cancel your visit to the Guggenheim Museum within the 24-hour time limit then you will be charged for the full ticket price. 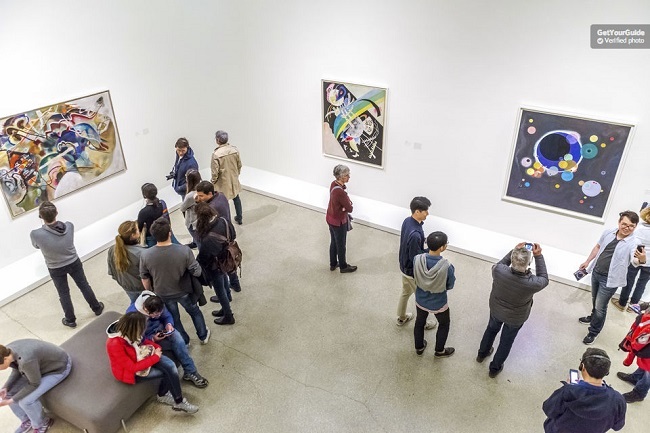 The Guggenheim Museum’s Art in the Round tour is included in the admissions price and tours operate daily so there is no need to reserve your place on the tour. Your entrance pass is valid for the reserved date only. There is no specific entrance time and you will be able to use your pass to exit and re-enter multiple times on the same day. Meeting Point: go to the entrance of the Solomon R. Guggenheim Museum, 1071,5th Avenue, 10128, New York. You can reach the museum with bus lines: M1, M2, M3, or M4. Or with metro lines: 4, 5, 6, or Q.